Coastal Bend College adds oil and gas industry basic orientation to its list of continuing education and professional development courses. Terry Kirkpatrick, a safety trainer and consultant, joins the college bringing over 23 years of experience in the industry with him. 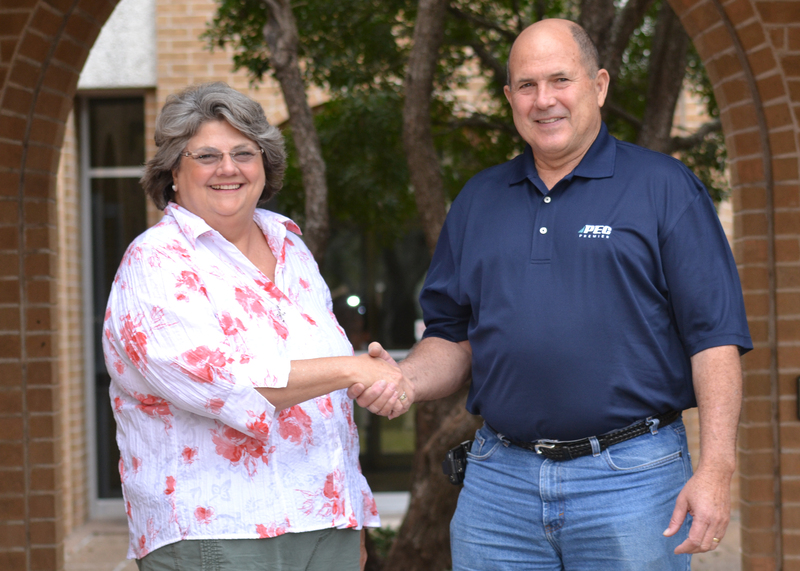 Glynis Holm Strause, left, of Coastal Bend College welcomes safety trainer Terry Kirkpatrick. The partnership will increase training opportunities in the Eagle Ford Shale. Kirkpatrick is a retired Conoco employee. He worked as a pipe operator, inspector, facility manager and safety manager. He has 12 years of experience transporting hazardous liquids; 13 years of experience in pipe lines operations and safety; and five years of facility management experience. He is certified for SafeLand, OSHA 10/30, First Aid CPR/AED, H2S Beyond Awareness and customized training. He is an independent instructor certified by PEC Premier to teach basic orientation safety awareness courses, including lock-out, confined space, respiratory protection, terrorism response awareness, emergency response and Hazwoper. “Oil and gas companies want to know that people have a generic and broad spectrum of knowledge when they come in for employment in the industry. New employees should be introduced to the hazards of the job and, at least, be able to minimally recognize hazards,” Kirkpatrick said. The orientation that he provides is accepted by several large firms as their basic orientation package. “A lot of times, you’ll have a mix of people new to the oil industry and seasoned veterans,” he explained. Kirkpatrick works with oil and gas companies to ensure that the types of training address the needs of particular groups. Training is held at the college or in an on-site mobile unit. Glynis Holm Strause, CBC Dean of Institutional Advancement said, “Some small companies can’t afford to hire contractors to come and train employees or have trainers on site at all times. Some can not afford to shut down operations to train the entire workforce. The flexibility that we are now able to offer addresses the needs of the industry as they were presented to us.” Mobile trailers used as site classrooms were purchased by the college last year with a charitable donation from Pioneer Natural Resources USA, Inc. The $25,000 award helped to outfit the rolling classrooms and furnish an on-site classroom used for professional development.